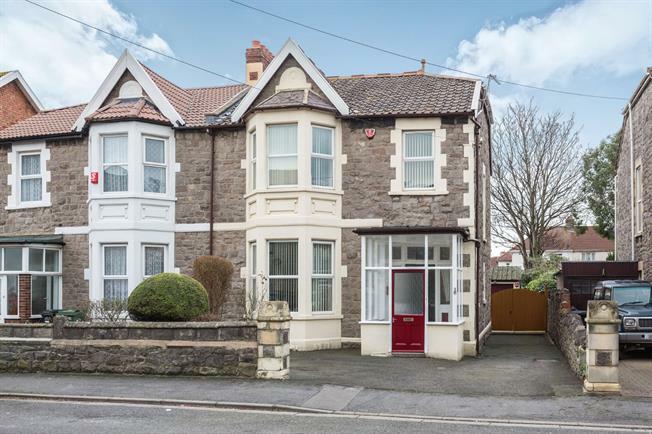 4 Bedroom Semi Detached House For Sale in Weston-super-Mare for Asking Price £330,000. This four bedroom semi detached home has been extended and offers space in abundance with four double bedrooms and three reception rooms in addition to a large workshop/garage to the rear. The property is entered via a glazed porch and comprises a large bay fronted living room, second reception room, dining room, kitchen, utility and bathroom on the ground floor. Upstairs there are four good size double bedrooms three of which have fitted wardrobes and a shower room. Externally, the property offers parking to the front of the home and to the rear there is a low maintenance garden in addition to a an outside toilet and large workshop/garage that could be converted into an annexe or developed subject to necessary consents. The workshop and garage both have strip lighting and power throughout. This property has plenty of potential and would suit either a large family or someone looking to develop and build a property portfolio.